Quote: "Riker was the lead engineer at Locomobile and was probably the "behind the scenes" designer of many of the early Locomobile automobiles.﻿" Andrew Riker did work with them, he was definitely one of the unsung hero's of that era. I keep seeing his name pop up. From what I can tell he started out building electric cars, then worked with Locomobile and Stanley on steam vehicles, and then went to work with Locomobile full on when they transitioned to gas engines and headed up their truck division. As I understand it, Whitney was their first head engineer in the steam era. Here is what an internet search just turned up: From this page: http://www.kcstudio.com/riker.html SAE's first president was Andrew L. Riker, an early pioneer of electric vehicles who later produced the Locomobile Company's first gasoline-powered car. Riker served as SAE president for three years, 1905 through 1907. Born in 1868, he produced his first electric car in 1894, using a pair of Remington bicycles as a base. Like the Columbia companies, which had several names and incantations during their run, the Riker companies had three names of incorporation plus two different home locations during their existence from 1896-1902. As listed in The Encyclopedia of American Automobiles published in 1971, these were Riker Electric Motor Company, Brooklyn, N Y. (l896-l899), Riker Electric Vehicle Company, Elizabethport, NJ (l899-l900), and Riker Motor Vehicle Company, Elizabethport, NJ (l90l-l902). The company became one of the country's leading manufacturers of electric vehicles, including cars, trucks, vans and trolleys. Rikers were combined and distributed with Columbias until the company was finally absorbed by Electric Vehicle Co and the brand ceased to be used for automobiles. Riker gained acclaim for his development of high-speed electric cars. In 1901, his electric-powered racer "The Riker Torpedo" set a world speed record for electric cars that stood for ten years. Five-ton electric trucks produced by the Riker Company were in use in New York City in the early 1900s. 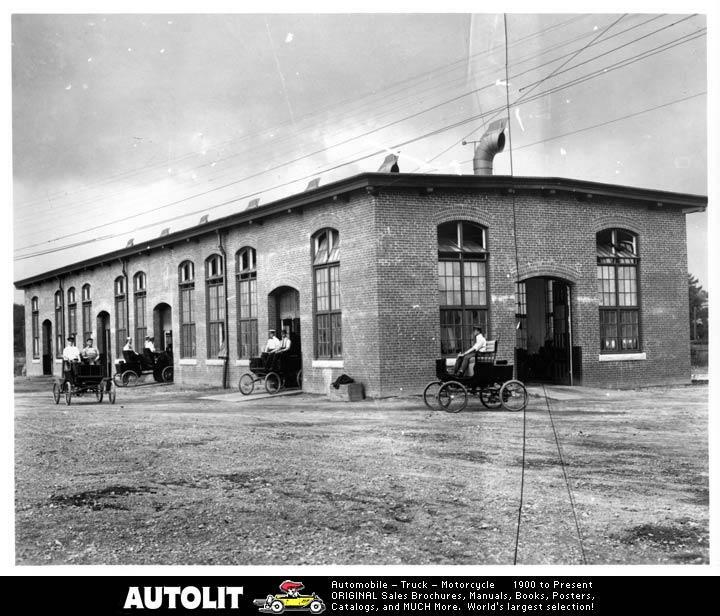 Riker became vice-president of the Locomobile Company in 1902, overseeing the firm's production of automobiles powered by two- and four-cylinder internal combustion engines. His design of the company's first gasoline-propelled car included many features which were largely unfamiliar to the American market, including a sliding gear transmission, steel frame, and gear-driven electric generator. In 1904, he designed a special 90-horespower racing car, and in 1908, he developed Locomobile's "Old 16," the first American car to win an international race (the Vanderbilt Cup). The victory boosted the reputation of American automotive engineering throughout the world. In the World War I era, Riker/Locomobile trucks were very popular, and heavily advertised in publications such as Scientific Americanand The Saturday Evening Post. Riker was appointed to the U.S. Naval Consulting Board in 1915, chairing the board's committee on internal combustion motors. Riker died in 1930. Three Riker electric vehicles, including a truck and a racer, are housed at the Henry Ford Museum in Dearborn, Michigan. The book Andrew L. Riker and The Electric Car - A Biography of the Young Riker by Neal Donovan, published by McPherson College Press in 2003, chronicles Riker's early experiments, his contributions to the fields of electricity and transportation, and his business dealings. It's highly doubtful it's a scam. Scammers try to get their victim to download files or click on links. He's simply asking for information he can download. If you receive a message with an attachment or a clickable link from someone you don't fully trust, don't click on it. Doing so may download a malicious threat or take you to a website with malicious code. Good protection is to use Mozilla Firefox for the browser, it is much more secure than Microsoft Internet explorer. Most attackers target explorer because that is what most people use. Firefox has many built in protections. It has an up to date database of malicious sites and will block them if inadvertently accessed. If you're using Windows XP (still) or Windows 7 32 bit on the internet, it's time to upgrade, those old systems were very un-secure with easily accessed ports. Move up to at least Windows 7 64 bit (newer computer with a 64 bit mother board). 64 bit PC running Firefox is pretty bullet proof. This guy just wants help. -Ron If you're running XP your PC is most likely 32 bit, if you're running Win7 and not sure if it's 32 or 64 bit, click on the globe Windows icon in the lower left of the screen and type in "dxdiag", it will list everything about your PC.